well-known fable, the ones who refuse their help and are denied the reward. Peter headed straight for oblivion, but Donald, because of the unique contribution of voice actor Clarence "Ducky" Nash, was destined for better things. Within months, he was a bit player in such Mickey Mouse cartoons as Orphans' Benefit (1934) and The Band Concert (1935). Mickey's Service Station (1935) was the first of many in which Donald, Mickey and Goofy all played major roles. It was in Donald's Ostrich (1937) that he got his first star billing. He appeared in four animated features during the 1940s — Saludos Amigos (1942), The Three Caballeros (1945), Fun & Fancy Free (1947) and Melody Time (1948) — as well as a fifth, years later, Fantasia 2000. 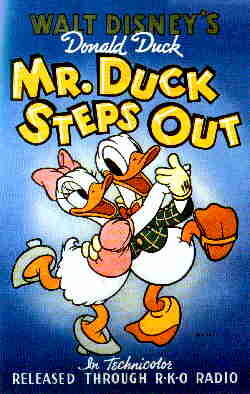 His girlfriend, Daisy, was introduced in 1937 (under the name "Donna Duck"). Donald received Oscar nominations for Good Scouts (1938), "Truant Officer Donald" (1941), Donald's Crime (1945), Chip 'n' Dale (1947), Tea for Two Hundred (1948), Toy Tinkers (1949), Rugged Bear (1953), and No Hunting (1955). His only win was for the rarely-seen Der Fuhrer's Face (1943), which parodied Nazi Germany and which the Disney company considers too dated for a modern audience. Most were directed by either Jack King or Jack Hannah. He quickly acquired a family. In Donald's Nephews (1938) Huey, Louie and Dewey came to live with him. Donald's Cousin Gus (1939) introduced the incredibly lazy and hungry Gus Goose. Much later, when Disney cartoons were seen mostly in TV compilations, an uncle from a European branch of the family, Ludwig von Drake, came along. It was also on Donald's coat-tails that Disney attempted to make a star of José Carioca. He followed a similar path in comics. He first appeared in the Silly Symphonies Sunday newspaper strip (which was loosely based on Disney's non-series animated cartoons) in 1934, and as a minor supporting character in the Mickey Mouse daily strip during 1935 and '36. It was in 1937 that he was given a strip of his own. During the late 1930s and early '40s, his newspaper strips were reprinted in comic books. Eventually, new material, designed for the more expansive comic book form, began to be produced. In "Donald Duck Finds Pirate Gold" (1942), animation director Jack Hannah collaborated with former cartoon story man Carl Barks on a full-length adventure story featuring the character. Barks and other artists, including Al Taliaferro, Tony Strobl and many others, continued the series. Barks then launched a series of 10-page sitcom-style stories featuring Donald and the Nephews, which ran every month in the comic book Walt Disney's Comics and Stories from 1943 until the mid-1960s. It was in this series that he introduced many of his most famous characters, including Gladstone Gander (1948), Junior Woodchucks (1951) and Gyro Gearloose (1952). Barks also did full-length adventure stories about Donald, first in Dell's Four Color Comics and then in Donald's own title, which continued long after Barks stopped writing and drawing it. Eventually, the U.S. comic book market shifted to the point where funny animal comics became marginalized. Even so, Donald is published in that medium in more years than not; and in practically every other part of the world, he thrives — in some countries, he even has a superhero identity (usually called Super Duck in whatever is the local language). Meanwhile, he's started appearing in new animation again. Quack Pack, which aired during the middle to late 1990s, took place a few years later than mainstream Duck stories, during the Nephews' teen years. And the whole cast, de-aged, returned for new cartoons as part of Disney's Saturday morning show, House of Mouse. Today, Donald Duck is recognized by people of all ages, the world over. His face appears on lunch boxes, T-shirts, and thousands of other products, including a long-running brand of frozen orange juice. And at any given moment, somewhere in the world, in any of a hundred languages, someone is reading a Donald Duck comic book or watching a Donald Duck cartoon. Text ©1999-2009 Donald D. Markstein. Art © The Walt Disney Co.